The Arts at the University of Maine at Presque Isle are kicking off an exciting new year in two special ways with a first-of-its-kind alumni show in a brand new space. 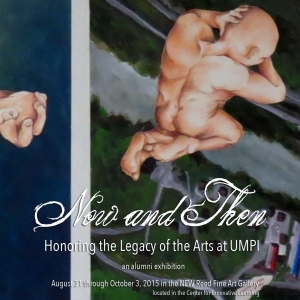 The alumni exhibit, entitled Now and Then: Honoring the Legacy of the Arts at UMPI and featuring 18 of the Fine Art Program’s alumni, will serve—fittingly—as the very first show to go on display in the newly relocated Reed Fine Art Gallery. The new, 2,000-square-foot gallery space, on the second floor of the Center for Innovative Learning, will open on August 31. Please save the date for a special celebration to “unveil” the new space to the community and rededicate the gallery on Friday, Sept. 18, from 6-8 p.m., during Homecoming Weekend. This will be a special evening honoring the namesake of the gallery. The exhibition on display in the new space will run from Aug. 31 through Oct. 3, 2015. Now and Then focuses on the success of the UMPI alumni. 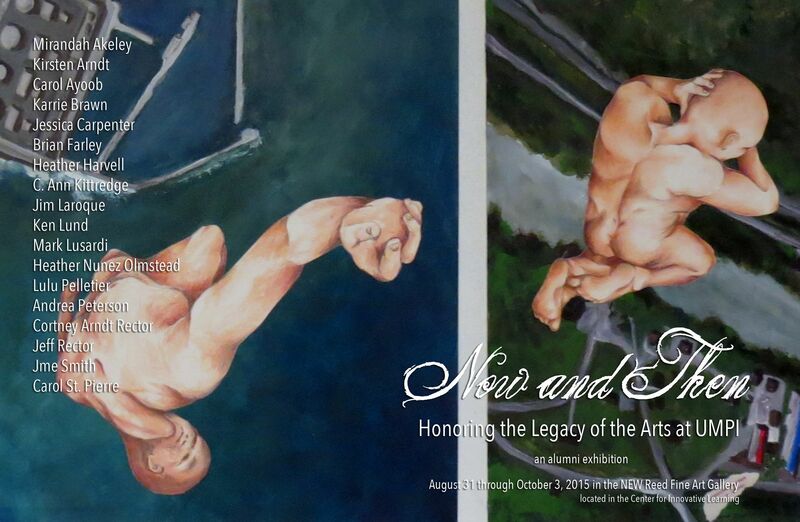 The premise of the exhibit is to feature two pieces of artwork done by each artist. One piece, considered the “Then” piece is an artwork the artist completed as an UMPI student. Their second piece, the “Now” piece, is an artwork completed recently. This may display the growth each artist had since their graduation and the evolution of their studio practice. The exhibition features graduates from four generations, although Professor Emeritus Clifton Boudman started the program in 1968. The earliest graduate featured in the exhibit graduated in 1988. Honoring the four generations represented in Now and Then, the Reed Gallery has created 4 limited edition designs of the exhibition postcard. The idea for this stemmed from the artist trading card craze, which has been incorporated by museums around the globe. Art enthusiasts can collect all four cards, which feature the work of Mirandah Akeley, Class of 2014; Carol Ayoob, Class of 1994; Ken Lund, Class of 1999; and Carol St. Pierre, Class of 1988. The exhibition features: Mirandah Akeley, Kirsten Arndt, Carol Ayoob, Karrie Brawn, Jessica Carpenter, Brian Farley, Heather Harvell, C. Ann Kittredge, Jim Laroque, Ken Lund, Mark Lusardi, Heather Nunez Olmstead, Lulu Pelletier, Andrea Peterson, Cortney Arndt Rector, Jeff Rector, Jme Smith, and Carol St. Pierre. In addition to its Opening Reception during the Sept. 4 First Friday Art Walk from 5-7 p.m., “Now and Then” will be open for the October First Friday Art Walk, taking place Oct. 2. Please follow gallery happenings on the Reed Gallery Facebook page, www.facebook.com/ReedArtGallery. The public is encouraged to come out to First Friday and attend this free event. Light refreshments will be served. The community is also encouraged to “Save the Date” and make plans to attend the Rededication Celebration on Sept. 18 from 6-8 p.m. This special evening is slated to include music, refreshments and a ribbon-cutting. The Reed Fine Art Gallery is open Monday through Saturday 9 a.m. to 4 p.m. The gallery is closed Sundays and University holidays. For more information, please contact Sincavage at 768-9442 or heather.sincavage@umpi.edu.